The British Armed Services is mounting an expedition to Antarctica in 2012 to commemorate Scott’s outstanding contribution to the nation and to science. 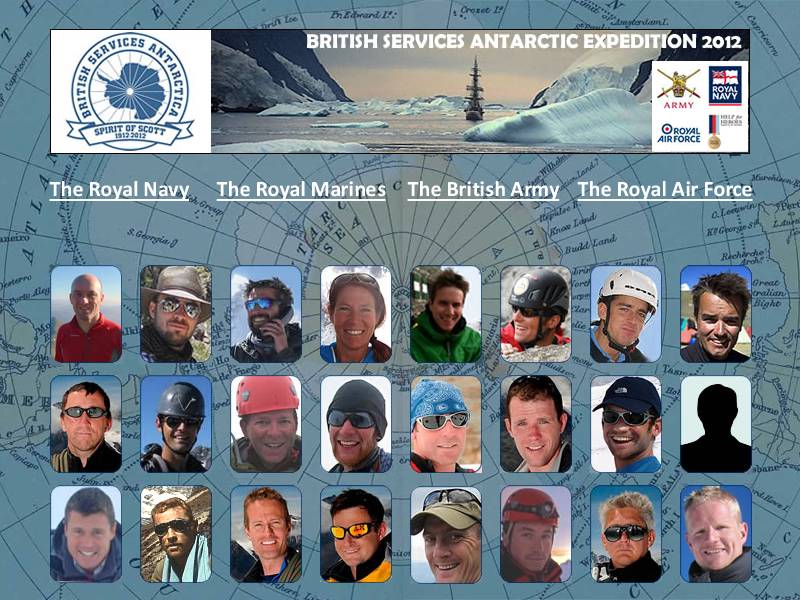 Here are some excerpts of the BSAE Expedition 2012 press dossier : "...It is the incredible story of Captain Scott Royal Navy and his team that is the inspiration for the British Services Antarctic Expedition 2012. "The British Armed Services will mount an expedition to Antarctica in 2012 to commemorate Scott’s outstanding contribution to the nation and to science. Beginning in January 2011, the BSAE2012 activity will form the key element of the British military contribution to mark the 100th Anniversary of Scott’s endeavours. Unlike other expeditions seeking to follow in Scott’s footsteps in 2012, the BSAE will travel in the Spirit of Scott, but not in his tracks. Instead, and very much in the ethos of Scott’s 1910-1913 expedition, the BSAE aim will be : to conduct scientific exploration in remote areas of the Antarctic Peninsula, seeking to further the bounds of human exploration and knowledge. The expedition will seek to conduct the scientific exploration in the Peninsula Arm of Antarctica, an area which is warming faster than anywhere else on the planet. Amongst other things, this science will contribute to an understanding of the factors influencing this rapid warming. Various activities will be undertaken to ensure the science activity is linked to an educational outreach programme to inform and educate the general public and in particular primary and secondary school children. The expedition will seek to emulate the values and qualities of Scott and present these through the information campaign. ..."
Senior Aircraftman (Technician) Alex Thorpe RAF, 31, has been a keen mountaineer and skier for over 12 years; having trained as a high altitude mountaineer in India and a military ski instructor in Norway, Alex has been on a number of climbing expeditions in India, the Alps, Dolomites, Kenya and within the UK. Lt Rob Tristram RN, 39, a keen sportsman and outdoor enthusiast Rob has enjoyed mountaineering and skiing for many years. His time in the Service have offered some great opportunities including climbing Mont Blanc in his first Naval expedition in 2009. Flight Lieutenant Alex Tomczynski MEng RAF, 30, has also devoted considerable energy into encouraging young airmen and women to participate in mountain sports as the publicity member for the RAF Mountaineering Association.